Bullish Resistance or Bearish Over Optimism? When the fundamental picture is characterized by threats galore, a mixed earnings season, and the biggest hope is for short term band aids from central banks, yet risk asset prices remain far closer to their multi-year highs than lows, then the odds do not favor taking new long positions in risk assets. Yet most risk asset markets remain in multi week (or longer) up trends. Why? First, we look at the fundamental picture. Events related to the EU crisis and its threat of igniting a wave of sovereign and banking system defaults remains the source for the biggest market moving news. Despite his bold words over the past week, there was little real action from Draghi, leaving markets waiting for the next ECB meeting in December, unless events force quicker action. Germany and its allies continue to resist what ultimately amounts to unlimited money printing, be it massive ECB purchases of GIIPS bonds, debt forgiveness, bank bailouts, etc. The GIIPS, France, and their allies in the ECB are more willing to gut the EUR’s value for the sake of keeping everyone solvent. The big risk is that suddenly the EU can’t act decisively when big cash is needed and we get a new Lehman moment. Both remain unsustainably high and serious doubt that either might not avoid default would be enough to ignite a new crisis and send markets plunging, and no rescue funds available. The EFSF will be nearly empty after the Spain bank bailout (it it happens) and the ESM not likely to be operating or funded until sometime in 2013. As noted in part 1, the ECB tossed its own rulebook aside in order to prevent a Greek default in the coming weeks. Can it continue to accept worthless collateral, and will markets stay calm about contagion threat from a Greek default, until the Troika reaches a decision in September on what to do with Greece? Ultimately, one way or another, Greece will not be able to repay what it owes. The only question is who gets stuck with the bill, the banks or the taxpayers. Even if the banks get hit, many would ultimately need taxpayer assistance to survive or to protect depositors and prevent bank runs. Markets loved them Friday, but on reflection they continue to suggest that the US recovery remains weak and vulnerable to any one of a number of potential shocks, ranging from a new EU crisis, the fiscal cliff, and more. Global stocks and most other risk assets closed positive this week, and some, like oil, moved sharply higher. While some say that markets are too optimistic, others suggest this resilience in the face of so many threats suggests resilience that limits downside in all but the direst scenarios. Certainly, low yields on investment grade bonds may have served to force many yield seekers into stocks. That can help as long as fear remains low enough for investors to value and additional percentage point or two above protection from a sudden 5%-15% capital loss if markets make a fear driven pullback based on the assorted threats from the EU, global slowdown, US fiscal cliff, etc. Quality bonds barely pay anything. Money market returns are worse. Stocks? Spain and Italy have banned at least some kinds of short selling, and the US has done so as well in recent years and could easily do so again “for the sake of market stability.” Meanwhile the big boys have their ways of circumventing those rules while the little guy gets locked out of some of the easiest to play trends of the decade. So if you need to hedge long risk asset positions or want to profit from short ones, remember that there are never bans on short selling in forex, nor any complex uptick rules to navigate. Despite its high risk and high leverage reputation, there are numerous ways to ride the strong trends generated by market pullbacks and crises, with no more risk or complication involved than with buying ETFs. While we remain in a secular bear market, having some exposure to currency markets is a no-brainer. You just have to know which methods are suitable for your preferred level of risk and simplicity vs. potential reward. 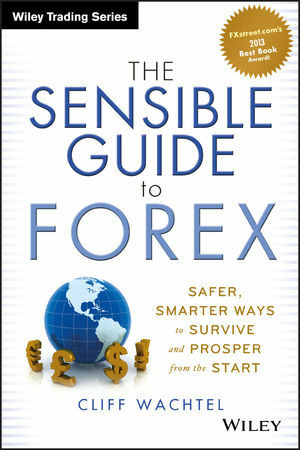 I cover these extensively in my new book, The Sensible Guide To Forex (Wiley & Sons) due out September 4th. Better still, my associates at Caesartrade.com are putting the final touches on a complete intro to conservative forex trading/investing course based on the book, free with your copy of the book. For contact details see here.